Himiko (卑弥呼, c. 170–248 CE), also known as Pimiko, was a female ruler of the early Japanese political entity known as Yamatai (邪馬台国 Yamataikoku), as described in the Wei Zhi (魏志, "Records of Wei"), a Chinese chronicle of the 3rd century CE. The location of Yamatai has long been the subject of intense historical controversy: at one time controlled by male rulers, Yamatai was described as situated in either northern Kyūshū or the Yamato (Nara) region. According to the Gishi Wajinden (魏志倭人伝), the section in the Wei Zhi dedicated to Japan, or the "Land of Wa" (倭), warfare erupted among the various countries inhabited by the Wa people around 170-180 CE. Himiko, a young female, described as still in her teens, emerged victoriously and was installed as sovereign by the chieftains of the most powerful tribes. Himiko enjoyed enormous popularity among her subjects, primarily because of her mastery of kidō (鬼道, "the way of subjugating demons"), probably a form of shamanism. Undoubtedly, her rule was mainly spiritual. Once she had become queen, very few subjects were allowed to see her. She is said to have had some 1,000 female slaves in her service; only one male was allowed to enter her living quarters to deliver food, drink, and messages. Her private quarters and their outer enclosure reinforced with palisades were strictly guarded at all times. Himiko as depicted by Angus McBride in Anthony Bryant's "Early Samurai AD 200-1500". Her costume is based on accounts in the Wei Chronicles and other texts as well as on archaeological findings. She wears beads typical for the later Yayoi Period around her neck. As Himiko was kept entirely secluded, it can be assumed that someone else had to take care of actual affairs of state. The Wei Zhi recounts that her younger brother assisted her in ruling the country, and may have been a second - secular - ruler who showed himself to the populace and looked after the concrete details of politics. This dual exercise of authority suggests that Himiko may have reigned during a period of transition from a rule based on religion to one founded on more "worldly" principles. At the time of Himiko's reign, the northern half of the Korean peninsula was under the strong influence of the Chinese Gongsun (Kung-sun) family, vassals of the state of Cao Wei. In the southern part of the peninsula ethnic groups known in Korean history by the names Han and Wae (Kan, Wai in Japanese) were attempting to gain more independence and, like the Wa people in Japan, were engaging in warfare among themselves. In the year 237, the Chinese Wei government intervened, trying to destroy the Gongsun. Gongsun Yuan, who had become chief of the Gongsun in 223, was defeated and killed the following year. In the summer of 239, ten months after the fall of the Gongsun, the first record of envoys being sent by Himiko to Wei China emerged. The Wei emperor Ming granted Himiko the title Quin Wei Wowang ("Wa ruler friendly to Wei"), as well as a gold seal with a purple cord. He also made a gift of exquisite textiles, a large number of bronze mirrors, and other items. A Chinese mission accompanied the returning Wa envoys, and later a second mission was sent to Wa. In 245, the Wei court sent yellow military banners to a person by the Japanese name of Nanshōmai, who, as Yamatai's chief envoy six years earlier, had been given a military title by the Chinese, possibly indicating that fighting had already broken out between Yamatai and a hostile country in Japan called Kona (or Kunu 狗奴). Two years later news of actual fighting was communicated by envoys to the Chinese commandery at Daifang. More yellow banners were sent to Nanshōmai, along with an official message from the Wei emperor to Himiko. It is likely that the war between Yamatai and Kunu was proceeding to the former's disadvantage and that Himiko's missions to Wei China were to request aid. In any event, the Wei Zhi suddenly announces Himiko's death without recording the outcome of the fighting. It reports that a substantial earthen mound was built on her grave site (possibly a kofun) and that over 100 male and female servants followed her in death. Given Himiko's position as a religious ruler, it is possible that she and her retinue were killed by tribal chiefs who thought that the unfavourable course of the war with Kunu was due to a waning of her magical powers. One of her nieces, a 13-year old girl by the name of Iyō, is said to have succeeded her. Interestingly, Japanese sources like the Kojiki (古事記 "Records of Ancient Matters") or the Nihon Shoki (日本書紀 "Chronicles of Japan") make no mention of Himiko. The Nihon Shoki, however, relates that the "Queen of Wa" dispatched emissaries to Cao Wei in 239. That queen (女王) has not been identified yet; it has been suggested that she is the same person as Jingū-kōgō (神功皇后), the empress consort Jingū, also known as Empress regnant Jingū (神功天皇 Jingū-tennō), whose rule began in 201 CE. The empress consort Jingū was a legendary, nonreigning empress (皇后 kōgō), who - according to the Nihon Shoki - ruled as regent between the reigns of the emperors Chūai and Ōjin in the late fourth, early fifth century. The Nihon Shoki states that this period lasted for 69 years 201-269 CE). 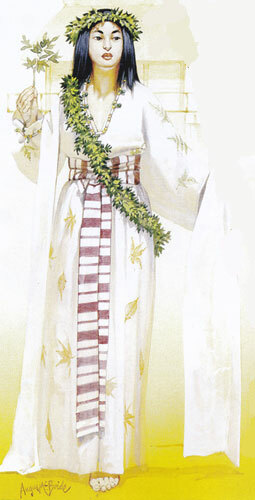 Jingū is described as the daughter of Okinaga no Sukune and Princess Katsuragi no Takanuka and the consort of Emperor Chūai. According to legend Empress Jingū subjugated the Kumaso people (熊襲) of Kyūshū after her husband's death and then sailed to Korea to defeat the state of Silla. Shortly after her return to Japan she gave birth to the future emperor Ōjin but did not permit him to ascend the throne in her lifetime. Historians believe that the legend grew out of various Japanese campaigns against Korea in the fourth century and that the figure of Jingū herself is an amalgamation of ancient shaman-rulers. A "waterbus" operating on the Sumida River between Odaiba and Asakusa designed by cartoonist Matsumoto Reiji and named after Himiko.